Your destiny is just waiting to be fulfilled. This Program is guaranteed to help you find the courage and motivation to act on your purpose and earn the rewards that come from pursuing the kind of work you love to do. It will also lead you step-by-step toward making each and every one of your dreams come true. All of us have what it takes to make it in today’s competitive and changing world. 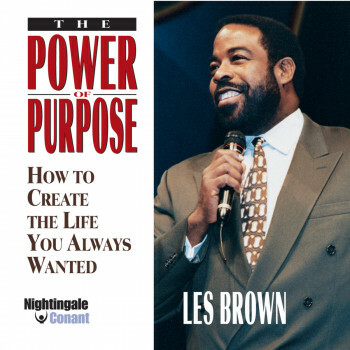 Les Brown’s exceptional new program, The Power of Purpose, will not only help you answer that question, it will also lead you step-by-step toward making each and every one of your dreams come true. Many of the world’s greatest leaders were called failures, until they discovered their life purpose. When you choose an occupation that is truly compatible with your preferences, abilities, and unique personality, you will at last begin to understand the meaning of true happiness and personal success. Your destiny is just waiting to be fulfilled. The Power of Purpose is guaranteed to help you find the courage and motivation to act on your purpose and earn the rewards that come from pursuing the kind of work you love to do.